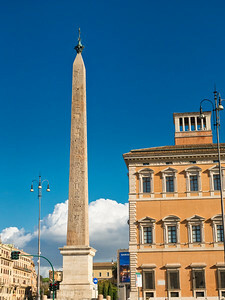 The Lateran Obelisk is the largest standing Egyptian Obelisk in the world, and stands prominently in a piazza in Rome, not far from the Colosseum. We kind of stumbled across this monument after visiting some basilicas in the area. I took a look at the Modern Atlas iOS app and found mention of the obelisk, so we wandered over for a look. In a busy piazza it would've been very easy to snap a couple of shots with one of the surrounding buildings in the direct background of the obelisk. I took a few minutes to find a vantage where I could frame the structure with sky behind. Because it was the middle of the day, I had to adjust my bottom crop to cut out the traffic and people out, with a quick bit of tidying up in post. 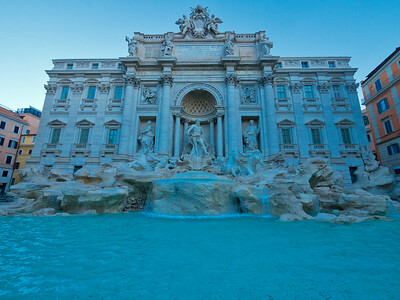 Perhaps the world's most famous fountain (and certainly the most famous in Rome), the Trevi Fountain is a spectacular baroque masterpiece not far from the Pantheon in the city's centre. In my other Rome images I have discussed my preference for the pre-dawn blue hour as an opportunity to get nice light and few people. This image was made after sunrise, but before the crowds. The image was created with a very wide angle of 7mm (14mm in 'full frame'). A little bit of straightening was done with DxO ViewPoint, and basic editing in Luminar. Even with a fairly featureless sky, blue hour is the best time of day to shoot for the clear, balanced light, and for the lack of crowds. 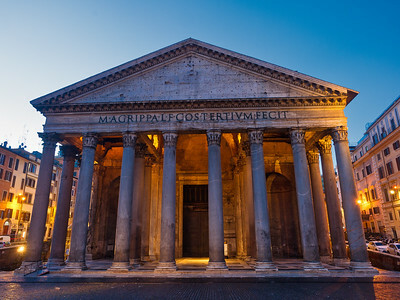 To get this image in frame required setting my tripod up on the fountain in the piazza in front of the Pantheon, using a wide angle lens. I accepted the bit of lens distortion, but found that I framed it too tightly to straighten the image up 'in post', but I am very happy with the image nonetheless. I love the cool light of the sky and the warm light of the illumination of this 2 thousand year old religious structure. Ironically, the lights were turned off moments after this image, changing the look altogether. The second image, without illumination has my wife standing at the base of the columns. This gives some perspective on the engineering awesomeness of this structure. 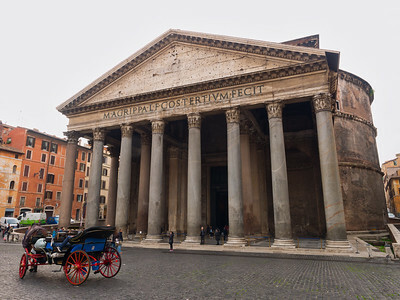 In the daytime there are many crowds around the Pantheon, with horse buggies and other street vendors. Daylight and crowds lead to very different shooting. After staking out a good vantage point on the Ponte Umberto I, I stayed there from the late afternoon (golden hour), through the sunset and into the blue hour. The exact same composition can deliver a range of different images. 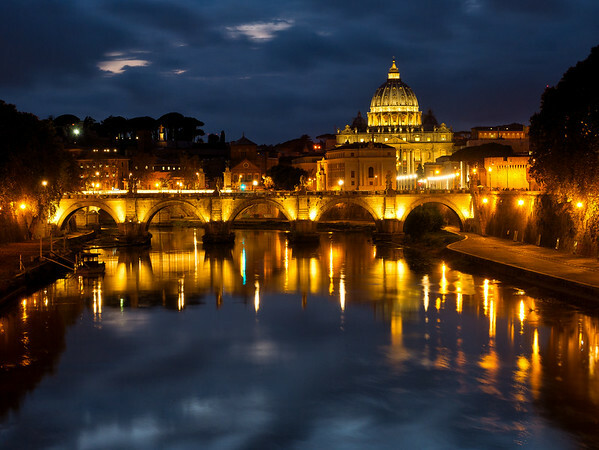 In this image shot in late November, the evening progressed and the river smoothed out, providing stunning reflections of the Vatican and early Winter sky. I watched as small boat rowed down the river. Knowing that the water's smooth surface and the reflections would soon be disturbed I worked timing to take an image with the boat approaching the reflection. 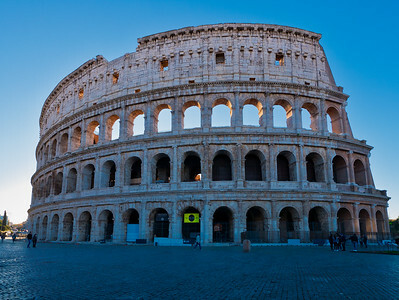 The Colosseum is such a large and important part of both the history of the Roman Empire and the City of Rome that it is actually hard to write something new and interesting about it. 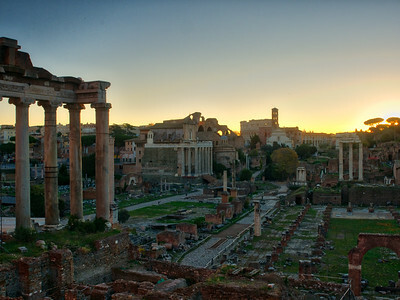 Photographically, any trip to Rome really needs to include an early morning or late afternoon flight. Not only is this to allow the best chance of getting good light, but also to catch the place when the crowds are minimal. 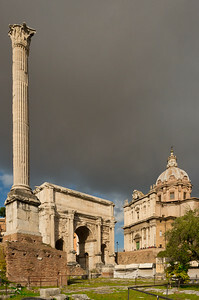 In this case we made images at the Roman Forum at Sunrise, and the went directly to the Colosseum. The crowds were far smaller than in the middle of the day, but it is almost impossible to shoot without people in the image. We visited in late November, perhaps one of the quietest times of year, but there were still lots of people about. In this case, I considered deleting some of the people in post, but decided that the people visiting the place is part of the Colosseum story. After these images, we went for some breakfast before touring this wonderful structure. I remain blown away by the sheer amount of history this place represents, starting in the Roman era, moving through the early Christian Church and into the modern era. It is a truly impressive structure, and the engineers of the Roman Empire must have been outstanding, and you could only imagine what they might have been able to achieve if they had modern technology to support their construction. A friend once said something to me along the lines of: "For Europeans 200km is a long distance, and for Australians 200 years is a lot of history." There is a lot of truth to this, as any building in Australia that is 200 years old is likely to be a heritage building. 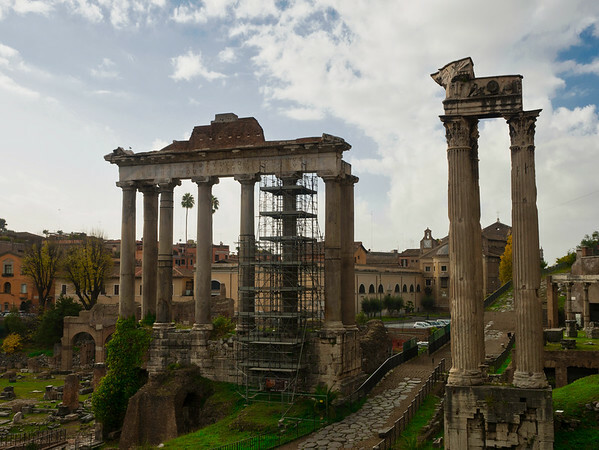 In Europe there are many buildings many centuries old still in daily use, and real heritage can be found in sites like the Roman Forum, which dates back for more than 2,000 years. We sought out a spot that is commonly referred to as the Forum Lookout, but found on scouting that there was a lot of scaffolding in place as key features are being cared for. So I came back to shoot a sunrise, carefully setting up to avoid the scaffolding and taking in a broad view of the Roman Forum. Scouting and perspective are important, and with a bit of thought a decent image can be made. One of the amazing things, at least to me about Rome is that so many centuries old buildings and structures remain in use today. A great example of this is Ponte Sant'Angelo — a bridge built in 134CE, and still used today as a main pedestrian thoroughfare. 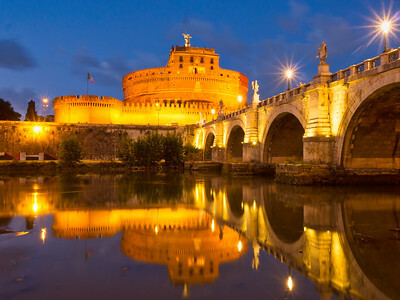 Distinguished by its 10 angels, the CBD of Rome lies on one side and the Castel Sant'Angelo lies on the other. 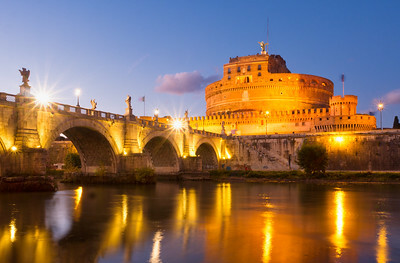 I created images of Ponte Sant'Angelo on two separate nights, and preferred this angle with the bridge on the left, drawing the eye left-to-right into the castle. Beautiful reflections and the star burst patters made for an image that I really like. I'd love to have had more drama in the sky, but happy with the overall result as it stands. 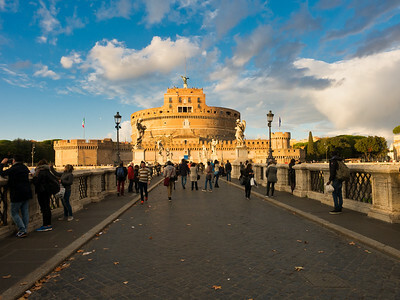 Castel Sant'Angelo must be one of the most photographed sites in Rome. 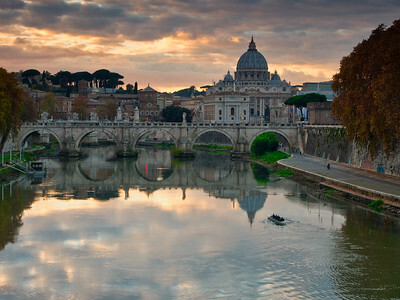 Given that Rome is one of the world's most photographed cites, that is really saying something. Having captured several of the classic vistas of Castel Sant'Angelo, I set about finding different angles. This street leading up to the bridge across to the castle presented an interesting composition for an afternoon image, with the shadows in the foreground, and the brightly lit castle behind. This image was shot hand-held, and some work was done in Luminar to get the lights and colours to match more closely the scene I saw on the day. After shooting the Roman Forum one dawn, we visited the site, easily spending a good half day exploring the various Roman ruins. Spectacular. It was a brilliant day, with beautiful weather, but some fairly ominous clouds came over the site, providing quite a spectacular sky. I found a composition that I liked with the column and dome. As shot, the image had some distortion with the straight lines of the column and the building on the right leaning inwards. I fixed the image with DxO ViewPoint 3. 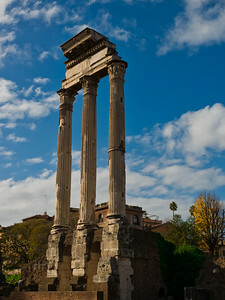 The Temple of Castor and Pollux is one of the ancient ruined buildings in the Roman Forum. Today the temple consists of three marble pillars, some foundational structure and little more. 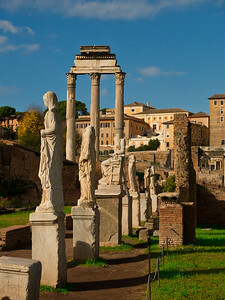 It can be seen from a variety of vantage points from around the Forum. I composed this image to get maximal sky between the columns, providing what I feel is the strongest image. A polarising filter was an important addition to my kit for this shoot, allowing me to minimise glare. The Garden of the Vestal Temple in the Roman Forum. This is the third in a series of photos made of the Vatican, from Rome's Ponte Umberto I, down the Tiber River and across the Ponte Sant'Angelo. After staking out a good vantage point , I stayed in place from golden hour, through the sunset and into the late blue hour, when this shot was made. As can be seen a single composition can deliver very different results with the changing light. This image shows about the point in the late blue hour where I normally call it quits. The darks of foliage are really blacks. In this case, the golden hue from the lights contrasts nicely with the blues of the water and sky, with wonderful reflections on the river. The point is, work a scene. Don't quit too soon and take your time to get a range of images. 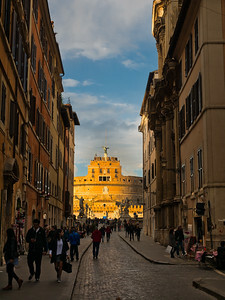 Late Autumn is a great time to visit Rome as the crowds are much smaller than they would be during the Summer months. 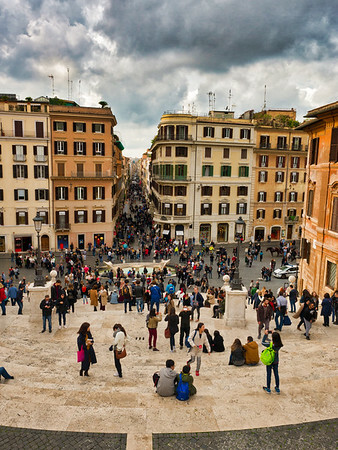 This image was created from the Spanish Steps, with a perspective down Via dei Condotti, an upmarket shopping street in city's centre. The presence of the crowds gives some indication of what the city might be like in the busier months. I am glad we visited when we did. It was an overcast day, but the use of filters and some image editing in Luminar helped to bring out the detail in the sky. The final image is much closer to the way I saw the sky on the day. 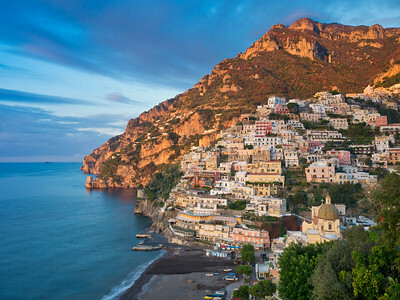 Famous for its spectacular coastline, seascapes and mountain vistas, life in Positano is literally built around the sea. The township is a year round magnet for tourists, and the crystal blue seas are a way that many get to and from the area, and are a major part of their enjoyment of it. Swimming, snorkelling, diving, sailing, fishing and other marine tourism are all important. During the quieter winter months fewer people swim, but there are constant reminders of the role that the seas play in the town's rhythm of life. After shooting the vistas of the township each sunrise from different overlooks, I felt the need to do something different. Along with the Steps of Positano, I felt that the *working sea* is an important part of the township's story. 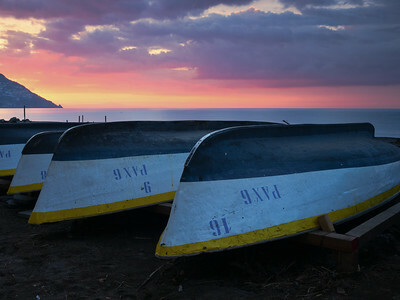 Image made as the sun began to rise over the headland further east on the Amalfi Coast. A 6 stop GND filter helped to balance out the strong highlights with the dark shadows, as well as providing glassy smoothness to the sea. 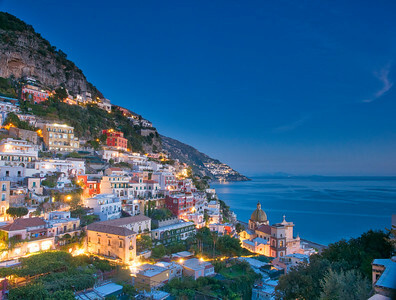 Positano is known for many things - beaches, restaurants, bars, walks, magnificent scenery and more. Perhaps however it is most known for its many, many stairs. The town really has only two roads - the main highway the winds between Sorrento and Amalfi that cuts through the high part of town, and a second road that winds down from the main road near Chiesa Nueva (New Church) and rejoins the main road near the Sponda bus stop. Footpaths on these roads are limited, to say the least. 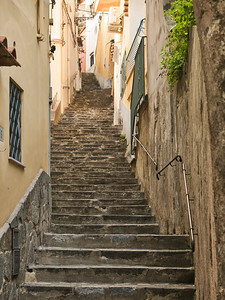 Getting around town, from the heights down to the beach is generally done on foot and by the many stairways. Shooting these stairways can be challenging as the light range can be quite broad. Shooting early or late in the day, or on an overcast day, can help. This image was made in the morning, and was framed to accentuate the winding stairway, and to use a slightly downward angle to emphasise the nearest stairs, and to crop out the brightest parts of the scene. 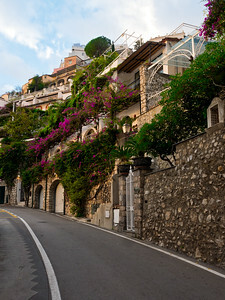 Positano's stairways are part of this township's story, and are worth exploring, photographically. 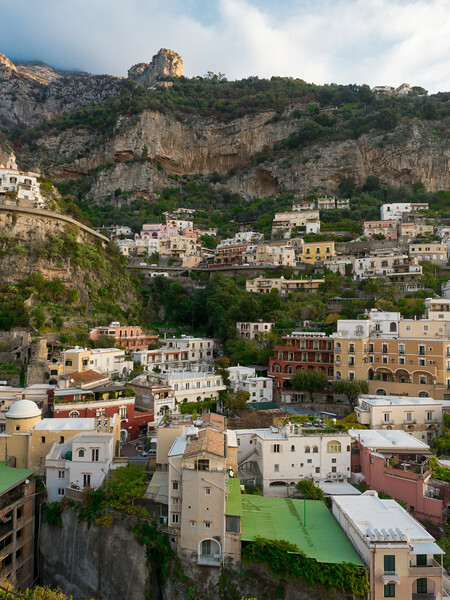 One of the many gorgeous townships on Italy's Amalfi Coast is Atrani, a village literally 10 minutes by foot from Amalfi. Atrani is a pretty town cutting into another gap in the coastal mountain range, quickly rising up from sea level to the heights above. Our day trip to Amalfi and Atrani (from our base at Positano) was literally from morning until about 6:30pm. With the early sunset in our low season visit this was actually plenty of time. 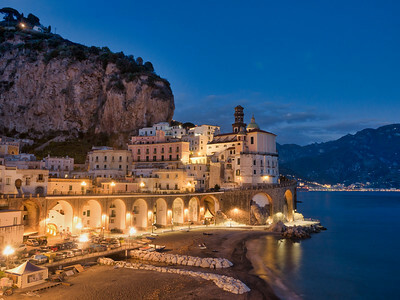 After arriving in Amalfi we walked straight to Atrani to find a shooting spot. We found this, and then walked back to Amalfi for a visit to the Basilica, some lunch and a visit to the paper mill. We then walked back to Atrani to shoot sunset and blue hour, before walking back once more to Amalfi to catch the bus. So we had a pleasant day of exploration, and getting the scouting out of the way early, using tools like The Photographer's Ephemeris to plan sun angles, meant we could relax and take our time. Travel photography is about exploring, but it is also about relaxing. Good planning and preparation allows you to do both! This series of photos from Positano in Italy have showed different aspects of the town, its stunning coastline and some individual characteristics of the township. This image, shot from the same western overlook from which I shot the image 'East from Positano' shows the scale of the town growing up from the Piazza dei Mulini area in the centre of the town, extending up the heights of the surrounding mountains. The township is very much situated in what looks to me to be a fjord cut into the mountain range by the sea. The building next to the green roof in the bottom of the frame is the wonderful AirBNB place we stayed at, and is situated right in front of Piazza dei Mulini. As a photographer it is also important to sometimes turn the camera around to do a different perspective. While the East from Positano image has an amazing vista, this one is pretty good too, and is a key part of my Positano story. I think this image helps to illustrate the scale of the heights of Positano as it rises from the sea into the mountains. After a successful shoot in the blue hour from the eastern overlook of Positano, I decided to go back to the same location for sunrise photos the next morning. The early backlighting from the sun behind cast a really nice light over the township, lighting the surrounding mountains up with a beautiful golden hue, and bringing out the details in the various pastel coloured buildings built up and down the town's hills. This differentials of colours were accentuated with the use of a GND filter and a polarising filter, with some slight enhancement done in my favourite photo editing software, Luminar. Lesson here, even when you have a good shot from a location don't be afraid to go back at different times to really explore the location and the image possibilities. This image, shot from the same western overlook from which I shot the image 'East from Positano' shows the scale of the town growing up from the Piazza dei Mulini area in the centre of the town, extending up the heights of the surrounding mountains.